At the end of June each year, not long after the completion of the draft, the short-season minor leagues begin. The GCL Twins stay in Ft. Myers, and the Elizabethton Twins take the long bus ride to Tennessee. The GCL Twins finished just outside of the playoffs. The E-Twins just won their eighth Appalachian League title since the turn of the century and second in a row. The last couple of seasons, Twins Daily has added two annual awards for the short-season Twins players. Tomorrow we’ll hand out the award for the top hitter in the short-season teams, but today, we’ll start with the pitchers. The previous winners of the Short-Season Pitcher of the Year awards have gone on to continued success. Our 2016 choice was Huascar Ynoa. He had spent that summer in the GCL, and he began 2017 with Elizabethton. However, at the July trade deadline, he was traded to Atlanta in exchange for lefty Jaime Garcia.In 116 1/3 innings, he struck out 131 batters between Low A and High A. The 2017 winner was lefty Jovani Moran who was dominant in the Elizabethton bullpen that year (to the tune of 51 strikeouts and six walks over 28 1/3 innings). He began this year in Cedar Rapids where he was our choice for minor league relief pitcher of the month in June with the Kernels and then July with the Ft. Myers Miracle. As you’ll read below, there were several pitchers on the Twins short-season teams who put together real solid seasons. Most of the Elizabethton starters were really good throughout the year. Of course, we are generally talking about a limited number of innings due to their seasons being just two months long. One poor outing can have an effect on their overall numbers. Six Twins Daily Minor League writers voted for the various awards this year. For the short-season pitcher of the year, we each voted for five players. The player who was voted as #1 received five points, #2 received four points and so on with the #5 vote receiving one point. Results were tabulated and can be found below. Short profiles of our top five are to follow, but first, some players worthy of honorable mention. These players also received votes. Josh Winder - Elizabethton Twins - 9 GS, 3-1, 3.72 ERA, 1.11 WHIP, 38.2 IP, 37 H, 6 BB, 42 K.
Here are the top five vote getters for Twins Short Season Minor League Pitcher of the Year. Breek signed after the 2017 season out of The Netherlands. He arrived in Ft. Myers after regular spring training but for extended spring training. In 2016, the Twins liked something they saw from the then-16-year-old who posted a 7.51 ERA and a WHIP over 2.00 in the Dutch Major League in 2016. Breek did a nice job for the GCL Twins. He was once named the Twins minor league pitcher of the week. He’s got good stuff, though he is quite raw. Rijo came to the Twins organization at the July 31 trade deadline. He was acquired along with Taylor Austin from the Yankees in exchange for Lance Lynn. Rijo had primarily pitched for the Yankees Appy League affiliate, though he also had made one start in the Florida State League and one start in the New York-Penn League. The Twins sent him to E-Town and he helped the team to an Appy League title. While he pitched in just five games (and just over four innings per start), he continued to post real strong numbers in the Twins organization. Cha was the Twins 17th round draft pick in 2018 out of Cal State-Fullerton. He turned 21 shortly after the draft and began his career in the GCL. 13 of his 15 games came in the GCL, but he was promoted to Elizabethton where he made two appearances and then worked in the Appy League playoffs as well. The Twins signed Berroa on July 2, in 2016. He pitched in the Dominican Summer League in 2017. His numbers weren’t good, but the Twins saw enough to bring him Stateside in 2018. He spent most of his season in the GCL. He had a nine strikeout, one-hit, scoreless outing in the GCL. After the GCL season, he moved up to Elizabethton where he made one appearance in the regular season. Finally, he worked five innings of one-run ball in the E-Twins championship-clinching game. 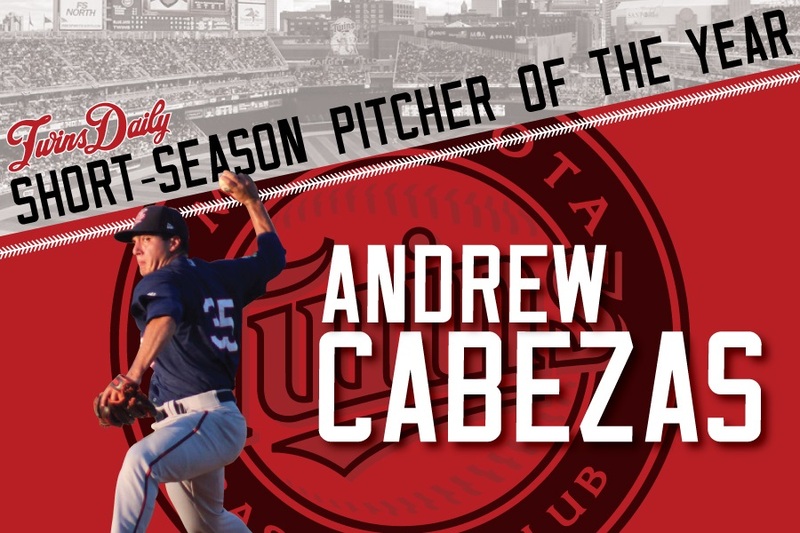 Pitcher of the Year – Andrew Cabezas, Elizabethton Twins:. 11 G 9 GS,, 1-3, 2.74 ERA, 0.96 WHIP, 46.0 IP, 30 H, 14 BB, 44 K.
Cleveland drafted Andrew Cabezas in the 34th round of the 2015 draft out of high school. However, he decided to stay close to home and attend the University of Miami. In his first two seasons at Miami, he worked primarily out of the bullpen. This season, he made ten starts and nine relief outings. In his three years, he went a combined 14-8 with five saves. He had a 3.69 ERA and struck out more than a batter per inning. The Twins drafted him in the 18th round in 2018 and signed him for $90,000. He signed quickly and reported to Ft. Myers before making the trek north up to Elizabethton. For the most part, Cabezas was used as a starter and did quite well. The E-Twins had a really strong starting rotation as evidenced by the other starters mentioned above. It was the key to the E-Twins winning their 2018 Appalachian League championship this year. There you have it, the top pitchers in the short season leagues for the Minnesota Twins in 2017. Feel free to discuss. What do you think? How would you rank them? How would your ballot look? Sounds like the Twins may have found a good one in Cabezas.Also sounds like a sharp young man who understands the cultural differences between Miami and eastern Tennessee! This is one of the categories where I wish you would include the players from the DSL.Expect there would have been lots of #1 votes for Anthony Escobar if you had. Coming back from TJ surgery, what are your thoughts on Benninghoff? Pretty excited about Breek and Berroa.Both are very young and appear to have swing and miss stuff.Not sure what to think of Rijo just yet.He certainly knows how to pitch at a young age but does he have the stuff to make it further than AAAA that I don't know.It is a nice group of guys but small sample size and the numbers (stats) at these levels usually don't tell us that much about the player.Lot's of guys have stood out in short season ball only to fall back to earth in A or A+ ball. Right now all of these guys look good and I hope they all make it but likely only 1 or two will. Something to sweeten all these numbers from the Elizabethton pitchers: The Appy League is a good place to hit. Teams score an average of 5.44 runs per game and the league average slash line is .262/.350/.396 (.746). Andrew Cabezas held opponents to a .180/.263/.263 (.527) line. The GCL swings the other direction, as the averages there are 4.67 runs per game and a .251/.334/.358 (.692) slash. Anyway, congrats to all the guys who were considered, great performances all around. As rdehring mentioned, Anthony Escobar deserves some attention as well. We don't cover the DSL, so we was not eligible, but the Venezuelan right-hander pitched to a 1.10 ERA, 0.75 WHIP and had a 3.79 K:BB ratio over 57 1/3 innings for the DSL Twins. He just turned 18 last month. Thanks as always Seth. Love the write-ups and updates on the minors, great job. Its unfortunate Montero couldn't get more innings. Was he injured? I am not in love with college arms like Cha getting so many GCL innings. Considering the Twins teams tend to skew those numbers, I'd be curious of the appy league numbers minus the Twins... there are what, six teams in that league or something like that? There are 10 teams in the Appy League. The Twins ranked fifth at 5.68 runs per game and were third with a .776 OPS. The Kingsport Mets paced the circuit with 6.44 runs per game and the Princeton Rays had an .824 OPS as a team. It doesn't help (and shouldn't hurt) any sort of prospect status. It just kind of is what it is. Hildenberger and Vasquez both spent their draft seasons in the GCL. They can only have so many pitchers at each level, and only so many in Elizabethton, so the rest of them go to the GCL. They're usually the guys drafted in the later rounds.